The Hussian School of Art is located on the second floor of Philadelphia’s historic Bourse Building. When I transitioned to full-time cartooning in April of 2012, I mentioned that one of the things I wanted to do that I didn’t previously have the time to pursue was teaching at the college level. Eighteen months later, I have some very good news to share. In January, I will be teaching a senior-level course on Arts Entrepreneurship at Hussian School of Art. 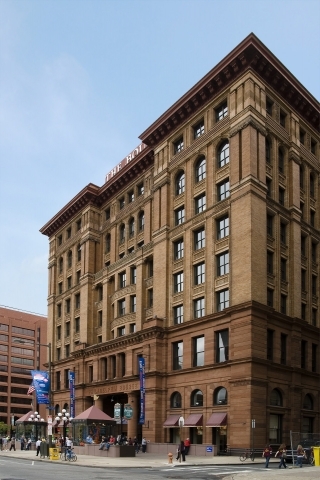 Located in Philadelphia’s historic Bourse Building, Hussian is a private vocational school for graphic design and commercial art. For a long time now, I’ve argued (sometimes loudly on Webcomics Weekly) that art schools need to do a better job of preparing their students for the Real World they’re being thrust into. And that means an overwhelming probability of freelance work and running a small business centered around one’s craft — not the studio jobs and staff positions that were prevalent decades ago. In short, it’s not enough to teach a student to draw or design. To really serve the students, an art school needs to teach them entrepreneurship. Now I get to back up those words with action. And I’m super excited to have the chance to do exactly that at Hussian. Absolutely, Brad… is it possible to agree on something MORE than 100%? Athletes always give 110%, right? Well, I am agreeing with the idea art schools need to have some kind of class on the business of freelancing 120%! So cool you are making this happen in Philly! Good luck! And, aye… one of the things my sister and I (I am an LMS admin, but I am also a part-time professor, she is a full-timer) recommend to a lot of our art students (and the artists that work for me directly), is to take a business class. Simply put, and this is not just the Art industry, these days you have to make your own job. I couldn’t agree with you more. One of the biggest flaws in my own education in Animation and Fine Art at Woodbury University was the fact that, yes, I ended up becoming a good artist, but I had ZERO training in how to really go out and sell it. I do fairly well with my convention sales, and the other plans I have are slowly coming to fruition, but almost all of it I’ve had to learn second-hand as I go, usually after someone else has a successful idea. Very frustrating. I wish I had access to a course like the one you teach. I KNOW I’d find it fascinating. Congratulations! HUZZAH! Thanks to both you and the Hussian School for filling this niche with your unique skills and perspective. This is a great opportunity for everyone! Congrats, Mr. Guigar. You are a fountain of knowledge on this subject and your students will benefit from your wealth of experience. Huzzah for the Arts!! Whatever they’re paying you for this class, it’s not enough. Such practical, real-world-experience instruction is invaluable and indispensable for people pursuing careers in the Fine Arts.